Portland, OR (10 March 2015) – OpenSesame is pleased to announce the dates of the first annual Training Jam, a gaming hackathon created to foster innovation and explore new formats for employee development. ​Approximately 40 game developers will be given their choice of 5 training topics that are relevant to today’s business needs, and over the course of a weekend work to create a new and unique approach to knowledge communication. Over $4,000 in cash and prizes will be awarded at the end of the Training Jam in different categories: Best Game Prototype, Best Game Concept, and Participants’ Favorite. Why is delivering knowledge via gaming important? Millennials are now the largest generation in the workforce, with Generation Z just starting their first jobs. These two generations are accustomed to getting entertaining and educational content from YouTube, Snapchat, social media channels, and other online sources. If the training content that these new generations encounter in the workplace isn’t received well, it won’t hold their attention, won’t engage them, and ultimately won’t be effective. That translates to a big problem for organizations recruiting a generation that consistently cites access to career advancement training as something that is extremely important to them. The status quo is “Gameification”, which is adding entertainment elements to course design,and has had mixed results. OpenSesame wants to forge a new path. “This isn’t about elearning gamification, where game-like elements are layered onto traditionally designed courses. Instead we want to spur innovation by having independent game designers, experts in entertaining and engaging users, create real games that transfer knowledge. We want to see if we can trainify gaming, not gamify training,” – states Josh Blank, Co-Founder, and SVP & GM at OpenSesame. A project like this is a natural for OpenSesame. Founded as an innovative answer to a need in the corporate training world for curated, relevant, quality and affordable off-the-shelf courses, OpenSesame has always pushed the boundaries. “Innovation that has practical applications is in our DNA, so bringing diverse groups together like corporate learning experts and game designers to pioneer a new way of thinking in course design seemed instinctive to us,” said Blank. 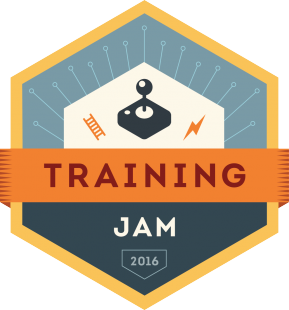 The Training Jam powered by OpenSesame will take place at DeskHub (334 NW 11th Ave) in Portland, Oregon April 22-24, 2016. To learn more about the Training Jam, visit www.Training-Jam.com or follow @trainingjam on Twitter.